Now how great is Whole Foods for taking on the task of recycling corks. Here in Napa that is a must, as we go through so many bottles of wine each year. 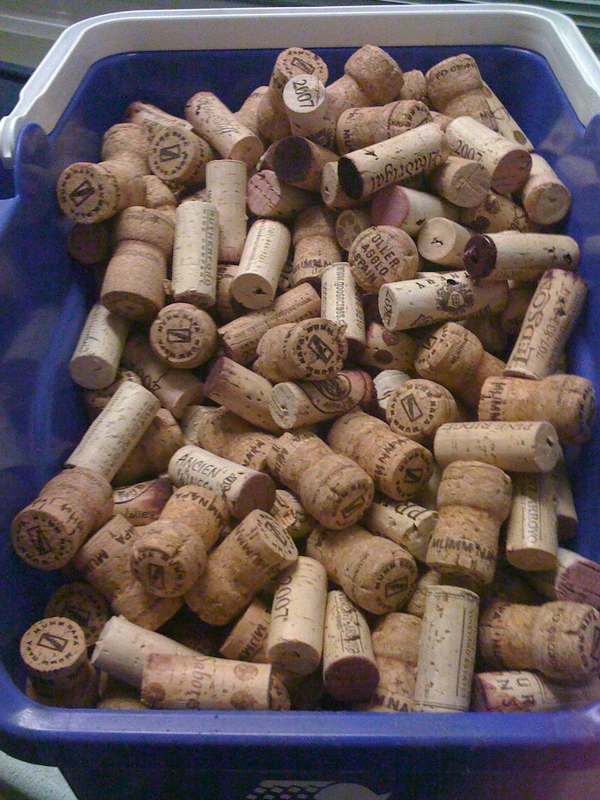 We started recycling corks about six months ago and we’re going strong. We picked up a couple of small containers from the Napa Recycle Center and we use those to build our collection. It’s only a five minute drive and there is a certain satisfaction in dumping all those corks into the bin. Okay, maybe a whimsical thought that someone at the store thinks that I drank all those bottles of wine myself! Here is a link to the full story: http://blog.wholefoodsmarket.com/2010/04/cork-reharvest/. I am going to say it and get it out of the way: it is really noisy in the restaurant. The ambience has a touch of the whimsical and reminds me a bit of New York City. I love the grapevine display behind the bar, and the view out over the Napa River (albeit not a large river) is really nice. You get to walk right by the kitchen as you enter and eye all the gorgeous plates being prepared. I didn’t even know what I was looking at, but I wanted to enjoy the show. No one pushed me along. Even Chef Morimoto, just paces away from me, didn’t ever indicate that we were in the way. It was fun to see him in white shorts and white tennis shoes with a long chef’s apron around his waist; my preferred outfit during the hot summer months. Up until then I thought it looked goofy on me; but now I see that he has followed my lead, and I think I will continue what I’ve been doing. Don’t hesitate to ask him for a picture if he is available: I did and he immediately said yes. Now that was fun! The food? Oh my goodness. The menu is large, eclectic, and will take some time to digest. Just the sushi and sashima selections are immense. Add to that such things as candied olives with hamachi tartare, or foie gras peanut butter with fig tempura and pomegranate reduction, and you will begin to appreciate why it takes time to read through the whole menu. The more you read, the hungrier you became. I had to remind myself that I could come back and that I didn’t have to try everything the first time. Jamie ordered the Brandino (white whole fish) fried and served with Asian Slaw, and the Spicy Crab Legs (there just wasn’t enough of this: it was spectacular). Our friends ordered the Clam Miso and Tofu Miso (delicious), and enjoyed a dish of Green Tea Noodles. I ordered the Tofu at Table, where they bring the soy milk and nigiri, stir it together and 10 minutes later you enjoy soft, silken tofu with various condiments. The hit of the evening was the Fish in Clay Pot, brought to at table with a warning that the pot is over 400 degrees hot. Everything gets cooked at the table, and after a few minutes of waiting, your dig in and enjoy a myriad of flavors. I don’t want to forget to mention either Morimoto’s Hamachi Tartare, a signature dish, that for sushi lovers will delight in its presentation and the different sauces/condiments that are provided with it. Also, instead of wine I ordered various sakis, and that was a pleasure. You can be exposed to many different sakis over the course of your meals, and each one brings a different character to it. I love it. As long as you are willing to put up with the noise (during the Summer you can eat on the patio) level, the food was just really great. So happy we now have a high-end fish house in Napa that doesn’t necessarily break your pocketbook. The dishes run from $5 on up to over $30, depending on what you order.